Spring Break is coming up in a few months, so if you’re the planner-type, now is the time to start thinking about where to go. There are many beach towns in Sonora that are popular among for Spring Breaking, like San Carlos, Puerto Lobos, Kino Bay and Puerto Libertad. 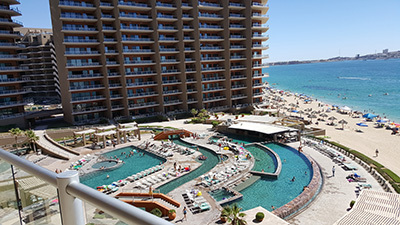 Yet, a large majority of folks choose “Arizona’s Beach,” also known as Rocky Point (Puerto Peñasco in Spanish) because it’s close to the U.S. border and has all the things needed for a good time. 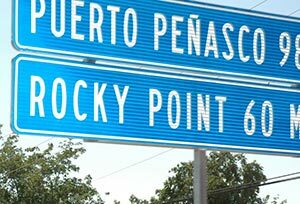 About four hours drive (approximately 200 miles) via car from both Tucson and Phoenix, Rocky Point is closer than the beaches in San Diego! And, it’s an easy jaunt from the U.S.–only an hour from the Arizona border. 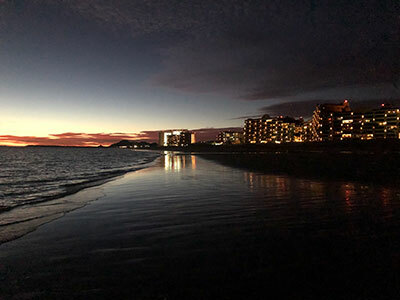 Puerto Peñasco is on the Sea of Cortes and features a range of resorts and beaches, activities, a bar scene and great seafood. It’s a popular spring break destination for students and families, so read on to find out more. Why, a community in Arizona. From there, take Arizona Highway 85 south to the Lukeville, Arizona / Sonoyta, Sonora border. Take Mexico Highway 8 until it dead ends in Rocky Point. From Phoenix: Take Interstate 10 west to Arizona Highway 85, then head south until you reach Sonoyta. From the U.S./Mexico border take Mexico Highway 8 until it dead ends in Rocky Point. The Puerto Peñasco Convention & Visitors Bureau points out that the Lukeville/Sonoyta border crossing is open from 6 a.m. to midnight. It advises travelers to use Highway 8 only in the daytime. Bring your passport (you do not need a Temporary Vehicle Importation Permit). While the beaches are the main draw for this area, definitely visit the Malecon. It offers a boardwalk experience with views of the sea and gorgeous sunsets. You can sample the street food and get your seafood fix, hit the bar scene, shop for souvenirs and, if a festival is going on, relax to live music. It can be a noisy, even rowdy, place to visit and is a must-do for many tourists. As for the beaches, Sandy Beach is where you’ll find most of the larger resorts. It features soft sand, banana boat rides, jet ski, paddle board and kayak rentals, horseback rides and lots of vendors. Mirador Beach is popular for its rocky tidal pools and sea shells, and the beach is all sand during high tide. Another beach, Las Conchas, is in a residential area. It offers seclusion and is ideal for reading, relaxing, walking and collecting shells. If you enjoy fishing, you may want to try Cholla Bay, also in a residential neighborhood. Though, it’s not where you want to go if your aim is to frolic in the sand–not much sand there! Since there’s so much sand in Rocky Point, ATV rentals are very popular and plentiful. Cholla hill or sand mountain, next to Cholla Bay, is where you’ll find all kinds of 4-wheel vehicles. Romp around on the hill, ride the beaches or explore all of Rocky Point on an ATV. It’s an adventure all it’s own. Other things to do include sunset Pirate boat rides, fishing excursions, whale watching, oyster farms, and the CEDO Intercultural studies complex tour. 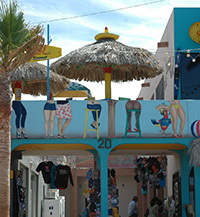 So, get to planning your trip to Puerto Peñasco, there’s lots to do and see. Discover why a spring break in Sonora can be amazing. Have fun! Don’t forget Mexico auto insurance before you go. Liability auto insurance is required by law. Get a quote now!